This article first appeared in the summer 2000 issue of the ITA Journal. When I first arrived into the Minnesota Orchestra, it became quite clear that I had some big shoes to fill. From my first day on the job, I began hearing story after story about my predecessor, former principal trombonist, Steven Zellmer. Some were hysterical anecdotes of jokes he would tell or pranks he would pull on the six week tours the orchestra used to endure. Others were more serious accounts of his love for the trombone and dedication to his orchestra. I soon understood that there would be no filling those shoes, for they were unique to the man who wore them for more than forty years. It was my great fortune to get to meet Steven Zellmer before he died in January of 1996. Ironically, I had studied with one of Steve's prize pupils, Boston Symphony Orchestra trombonist, Norman Bolter. Steve loved this coincidence, and laughed as he claimed this made me sort of a grand-student. We talked about Norman's early years, and I got to hear many stories about "the old days" in the Minnesota Orchestra. Even through his weakened state, he spoke enthusiastically about music, and it was clear that playing the trombone in the orchestra had been his life. Indeed, he passed away less than a year into his retirement. When he left the orchestra in 1995, Steve said to his good friend and program annotator of the Minnesota Orchestra, Mary Ann Feldman, "I loved the trombone from the beginning. For a while it was my downfall-I didn't care about anything else. 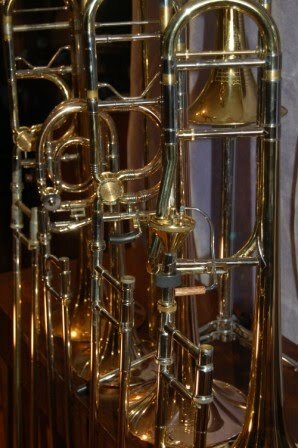 For me, the trombone is a love affair that has never ended." This love for the trombone prompted him to bequest a sum of money to the orchestra with instructions that it be used to fund a trombone competition for young players aspiring to succeed in the orchestral world. Thanks to Steve's generous gift, the Minnesota Orchestra now sponsors one of the largest trombone competitions in existence. Since its inception three years ago, the Zellmer-Minnesota Orchestra Trombone Competition has already awarded nearly $20,000 to very talented tenor and bass trombonists. Many of our winners and finalists such as Craig Mulcahy and Stephen Lange have gone on to win jobs in such orchestras as the Buffalo Philharmonic Orchestra and the St. Louis Symphony Orchestra. Others have continued their studies at such schools as the Juilliard School, the Manhattan School of Music, and the Cleveland Institute of Music. This competition is one of the few events where the participants are actually able to discuss their performances with the judges afterwards. It is also unique in that it contains elements of both a solo competition and an orchestral audition. Plans to expand and enlarge the competition's awards and prize money are currently underway in an ongoing effort to widen the competition's scope and provide even more opportunities for its participants. My colleagues in the low brass section of the Minnesota Orchestra and I sincerely hope that Steve would have been thrilled with the outcomes his gift has generated. While he may have balked at the use of his name in the competition's title, it seems only fitting that Steven Zellmer's name should continue to be associated with the trombone. Music and the trombone, after all, made up some of the biggest parts of his life. Perhaps Steve expressed his feelings about playing in the orchestra best when he said, "To have this day in and day out was a real privilege-the reward for us was incredible. I am more grateful for this than ever."